Tropical five-acre forested beachfront property with custom house and guest casita on the Osa Península, south Pacific Coast. Abundant wildlife, exotic plants and fruits, secluded beach. 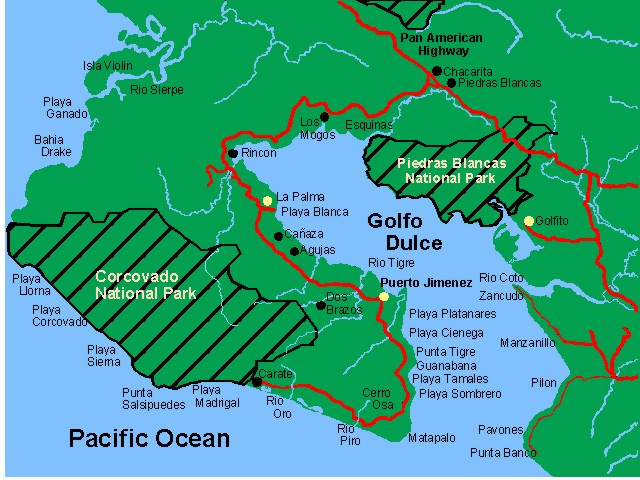 Located 8 kilometers south of Puerto Jiménez on the way to Matapalo and Corcovado National Park. This property is a secluded nature wonderland! One Hectare is titled, one hectare is permiso de uso; both held in the same corporation. House built by Brad Shenko in 2006, Solar installed by Intitech, new batteries in 2015. Sleeps six in two bedrooms and loft above the kitchen. Very solid rebar construction with a deep foundation. Standing seam metal roof, insulated below for heat reflection. Cathedral teak ceilings throughout the house. Hand carved nature theme doors with Baldwin life time brass commercial grade hardware. Hand painted tiles and sink in the bathroom, kitchen and bath. Solar powered house serves the fridge, lights, ceiling fans, lights, Sky TV, radio, stereo and laundry washer. Open plan living areas designed for the tropics; shaded by trees for afternoon sun and to circulate the Golfo Dulce breeze. Hot water in the Kitchen, bathroom and bath. Extensive plantings of Heliconias, ginger, teak, Ron Ron, bamboo, guyaba, bananas, papaya, mango, avocado, noni, avocado,wild almond and many species of citrus. Extensive shaded trails around the property and to the secluded beach in front. Abundant wildlife include monkey troops, sloths, coatis, tyras, otters in streams and iguanas. Scarlet macaws are always present; also toucans, hawks, green and red parrots, tanagers, flycatchers and dozens more. Ocelots are even seen at times. This property has year round access; and only 8 kilometers to Puerto Jimenez. Own water system from a deep well of very good quality water, pumped to two large tanks in tower. Secure bodega for storage and laundry. Guest house built from natural woods; two bedrooms, sleeps five, and has a five star rating on various vacation websites. Property is surrounded by forests and is very safe and secluded. Declared "one of the most biologically intense places on earth" by National Geographic Magazine, the Osa Peninsula ranks among Costa Rica's most beautiful places. The pristine rainforests and the its rugged natural beauty are the primary reasons the region has become the premier eco-tourism destination in the county.